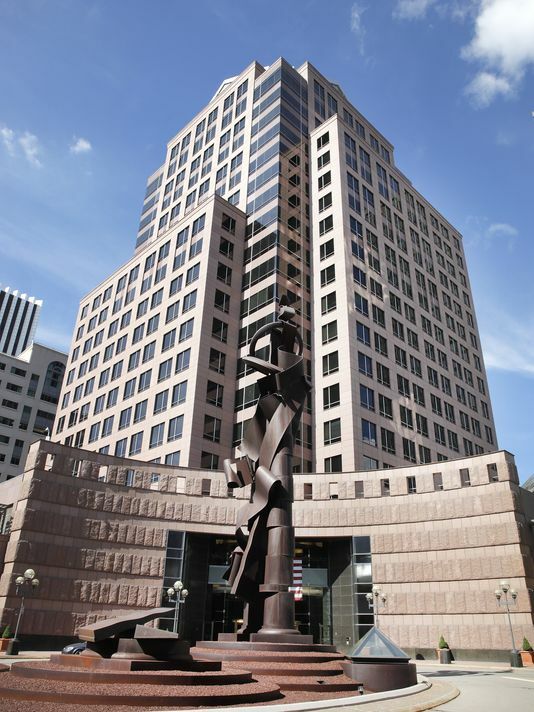 The Bausch + Lomb office building, one of downtown Rochester's most recognizable structures, has been purchased by three local developers led by Buckingham Properties owner Larry Glazer. Glazer said Friday that the price of the building is "in the neighborhood" of $15 million — far below the $70 million Bausch spent to construct the red granite tower in the mid-1990s. He said the purchase will be final at the end of July. The deal made with Canada-based Valeant Pharmaceuticals International, which bought Bausch + Lomb last year, culminates a couple of years of negotiation, Glazer said. Valeant officials did not respond to a request for comment. All of the B+L employees in the building have relocated, Glazer said, and the building currently is about half occupied, with nine tenants employing about 400 people. The other owners besides Glazer are Robert Morgan of Robert C. Morgan & Cos. in Pittsford and David Flaum of Flaum Management Co. in Rochester. Glazer said current tenants would not be affected by the change in ownership. He said he will be looking for retail tenants for the ground floor of the building. The 20-story building is one of the tallest in Rochester. Glazer said the name of the building will be changed when the ownership does. "I don't know what the new name will be yet," he said. Glazer said the purchase will enable him to better integrate the building into the ongoing efforts to develop the former Midtown Plaza site. "This is one of the few buildings with Class A office space left in Rochester," Glazer said. "Valeant has said it was interested in selling the building. This not only helps strengthen the whole area but ensures that the building owners do not work against what we're trying to accomplish downtown." Glazer and Morgan are two of the major investors in the Midtown project. The B+L ownership will be Flaum's first direct involvement in the project. Rochester Mayor Lovely Warrren said Glazer, Morgan and Flaum have shown their commitment to Rochester. "These are people who are willing to put their money where their mouth is," Warren said. "This will absolutely help the Midtown project." Heidi Zimmer-Meyer, president of the Rochester Downtown Development Corp., said the building is one of Rochester's best and that having local owners of excellent stature is terrific news for downtown Rochester. "Buckingham Properties has one of the best track records in the business of leasing space and finding tenants," Zimmer-Metyer said. "It's important to the development of downtown that important buildings like this are in local ownership." The RDDC currently in the process of creating a Business Improvement District for downtown that is meant to enhance city services and attract office, retail and residential buyers and tenants. "This community cares deeply about the B+L building," Zimmer-Meyer said. "It is one of the best buildings built in Rochester in the past 30 or 40 years." The tower has been on the market since 2010, when Warburg Pincus owned the eye-care company. Glazer's Buckingham Properties and another unnamed partner bought the 30-story Xerox Tower from Xerox last August for $30 million. That property had been on the market since 2009. At the time of that purchase, Glazer said that one of his goals was to incorporate the building into the overall Midtown redevelopment. WinnDevelopment, which is developing The Sibley Building across from Midtown, also welcomed the news. "This is another great story showing how much people believe in downtown Rochester," said Joseph Eddy, vice president for WinnDevelopment, in a statement. Buckingham Properties is investing in the reconstruction of the former Midtown Tower on the razed Midtown Plaza site. Buckingham also is developing the Alexander Park project at the site of the former Genesee Hospital. The Bausch + Lomb tower officially opened in October 1995 after two years of construction. The project was hailed at the time for its post-modern, sculpted design and glass-enclosed winter garden. "The building is probably the best example in this city of something that's playful," architect David Beinetti said just before the opening. "It's got a lot of things going on. It's got a great design. It's got great lights. It's got a great top. "It's the sort of building that this city needs badly."